Green Lake County vital records can be ordered from the Register of Deeds in Green Lake by mail, with divorce records from the Clerk of Court. Historical records pre-1907 are spotty and maintained by the Wisconsin Historical Society. Green Lake County's historical records date to 1858 for marriages, 1864 for births, and 1877 for deaths, with a statewide index. Records after October 1907 are also available at the Wisconsin Department of Health Office of Vital Records in Madison, by mail, fax, or in person, for $20/copy. Online requests are handled by VitalChek. 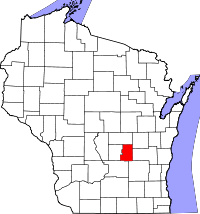 Founded in 1858, Green Lake had been part of Marquette County.